1945. “Our preparatory barrage against Ellershausen would begin at 3:15 and last for fifteen minutes. At the end of that time F Company and a platoon of tanks would advance under overhead machine-gun fire against the objective to the south and hit the town broadside. Image size is 14" x 18", overall print size is 18" x 24", edition of 125 prints. Print cost is $185 each plus $10 shipping and handling (and sales tax, if applicable). PLEASE NOTE: giclee prints are created one-print-at-a-time by expert digital printmakers, and as such, are never "in stock." Please allow 4-6 weeks for delivery. 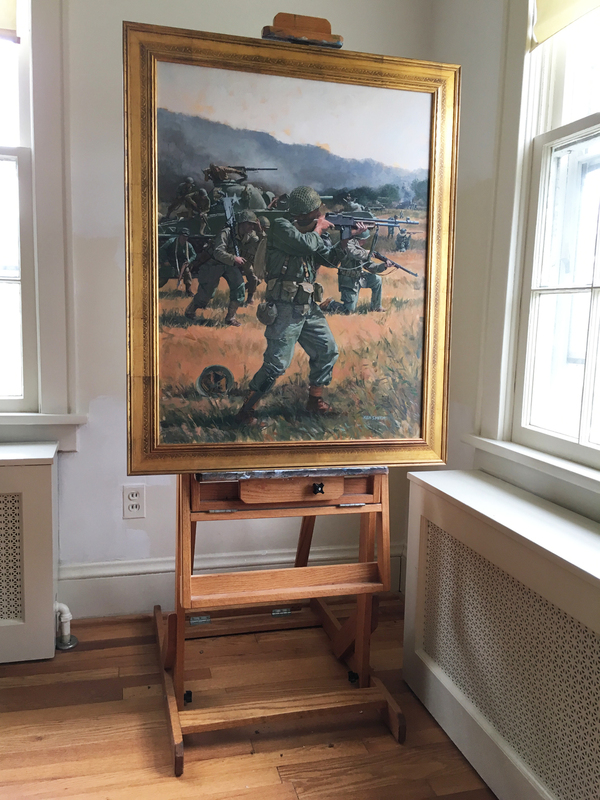 If a more timely shipment is required, please contact us at ksmith@kensmithhistoricalart.com for expedited printing and shipping. The ORIGINAL ARTWORK OF VICTORY IN EUROPE IS AVAILABLE FOR PURCHASE.